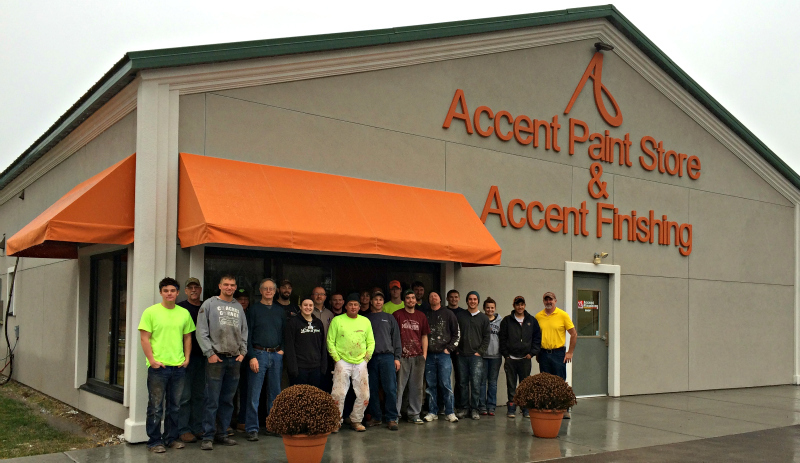 Accent Finishing started humbly in 2001, with operations based out of the owner, Ted Pretasky’s, rural garage. His determination, hard work and prayers made the business grow into what it is today. Ted’s team works hard, puts a high value on quality, pulls together in tough times, and rejoices in their blessings. You can count on them to take care of you! Accent Paint Store is conveniently located just three miles east of the Highway 53 bypass on Highway 12 in Eau Claire, WI. Come to Accent Paint Store and visit our paint store. We welcome existing and new home owners as well as contractors to shop in our store. We carry quality products that are superior to the big box stores at competitive pricing. Adjoined to our store is our shop. Here we prefinish everything from interior to exterior doors, kitchen cabinets, beds, and windows. Don’t hesitate to ask about your project…we’ve even finished guitars!